One of the UK’s leading manufacturers of aggregate recently contacted the technical team at Valves Online with a project that hadn’t been budgeted for; but one that needed to be implemented in order to comply with, and avoid potentially costly financial penalties. Namely…the control of dust emissions on-site. The solution was to recommend our new range of cost-effective Actuated Economy Butterfly Valves. Untreated water from settling pools was being used which was not suitable for conventional valves ie ball valves or solenoid valves. When the water was moved solids were mixed, resulting in blockages and subsequent failure of the valves. The location of the site was a testing one; hot and dry in the summer with damp, freezing winter conditions. The system would need to be able to handle 3 Bar pressure and consist of sixty manual valves, forty actuated valves and 4" pipework. Having spoken with the customer at length we offered our range of Economy Butterfly Valves... electric and pneumatically operated double acting actuated valves…as part of the solution. We recommended using these valves for a number of reasons and in a variety of locations - air being cheaper than electricity but more importantly as air was already on-site; a compressor having already been installed at the facility. One additional problem we had to overcome was the remote location and extreme weather conditions components would be subjected to. Pneumatic valves would not be able to be installed outside on the outlet discharge due to freezing of both actuator and airline, unless substantial lagging or heat tracing was undertaken. We therefore opted to install additional IP67 protected electrical economy actuated butterfly valves. These valves offer standard open and close electrical and optical indication, manual override, limit switches and anti condensation heaters! Perfect for cold, winter conditions. We also housed the solenoid valves that piloted the pneumatic actuators in control panels; supplying our Burkert Type 5470 DIN rail mounted pilot 4/2 way valves as part of the system. In offering our economy range of manual and actuated butterfly valves we have delivered results for our customer, solved the problem and completed the project on time and within budget! The customer now complies with all environmental concerns, avoiding potentially costly fines that could have been incurred had prompt action not taken place. 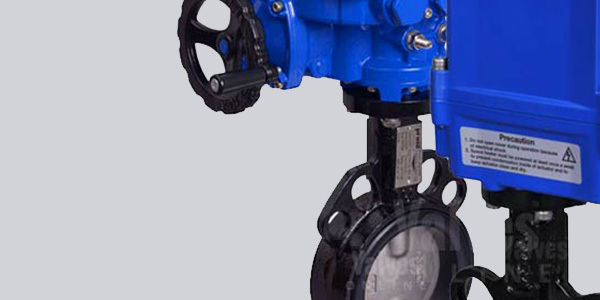 It is therefore clear to see that our Actuated Economy Butterfly Valves are the perfect choice for customers, installers and engineers alike who recognise the savings, benefits and ease of installation valves of this type and quality offer. 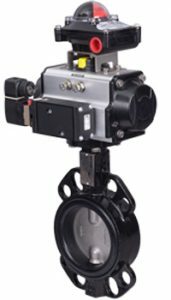 Ordering Actuated Economy Butterfly Valves is quick and easy to do. Build your perfect valve online choosing from either Pneumatic or Electric Actuation. If you require further information or need to check the correct sizing of your valve please call our office on +44(0)1822 855600 or +44(0)161 480 5700. For further information on remote piloted solenoid valves download the accompanying datasheet.